School of Computing, SASTRA Deemed University, Thanjavur, Tamil Nadu, INDIA. The world health organization report says the immunity deficiency is the biggest problem in the all over the world. Immune system can be improved through many fruits, especially grape is inevitable fruit that provides high neutrinos. The grape contains phytonutrients, Phenols and Poly phenols in rich amount. It is used for constipation, indigestion, fatigueless, kidney disorder, Macular degeneration and cataracts. The graph seed reduces swelling, Eye disease caused by diabetics and acting as antioxidants. In the research article, plenty number of classifiers were used to identify good type of grapes that provides the above said. The methodology applied in the work were Ada Boost and Machine learning Meta algorithm. The above areas were reviewed to the core.. The graph provides high protein, vitamins and minerals to the body for the improvement of immune system. It is one price worthy fruit that enhances fiber, hydrate the body gives healthy carbs acting as nan antioxidant, provides moderate proteins and myricetin. The flavanoids and quercetin will reduce the damage to the body caused by free radicals. In the grape has got essential minerals like potassium, calcium, magnesium, phosphors and sodium are the good electrolids. The Vitamins like K, A, C and B6, moreover thiamine, riboflavin, niacin and folate provides good immune system to the human body. A grape cures disease like Asthma, Bone weakness, Heart disease, Migraine problems, reduces blood cholesterol, acting as an antibacterial, avoids breast cancer, reduces risk of Alzheimer and improves immunity to the body. Two sets of an experiment can be carried out for new boosting algorithm first one is comparing boosting and bagging. This bagging method is also known as Bootstrap Aggregating which is a machine learning ensemble with Adaboost algorithm which is used to design for improving a stability and accuracy.13 The boosting algorithm was developed with new versions to be denoted as Adaboost.M1, AdaboostM2. 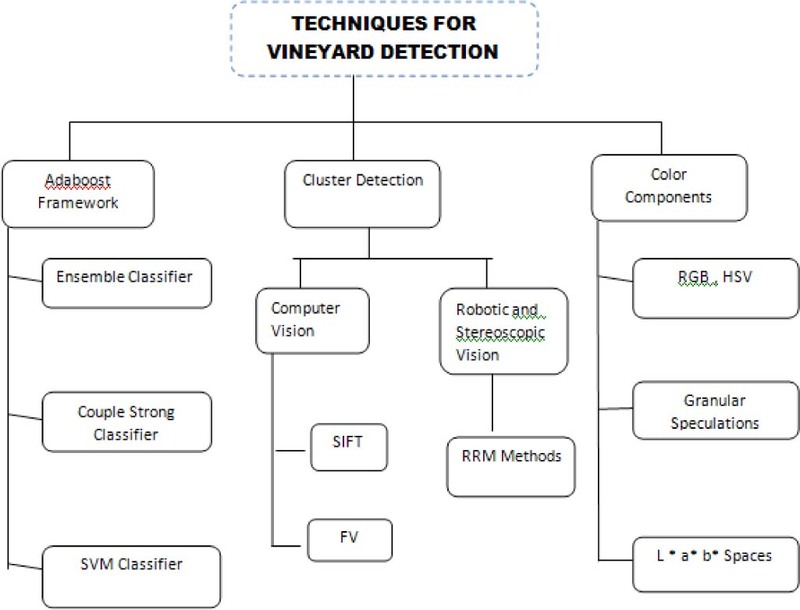 Diagrammatic Representation for Vineyard Detection and with Various Classifiers. 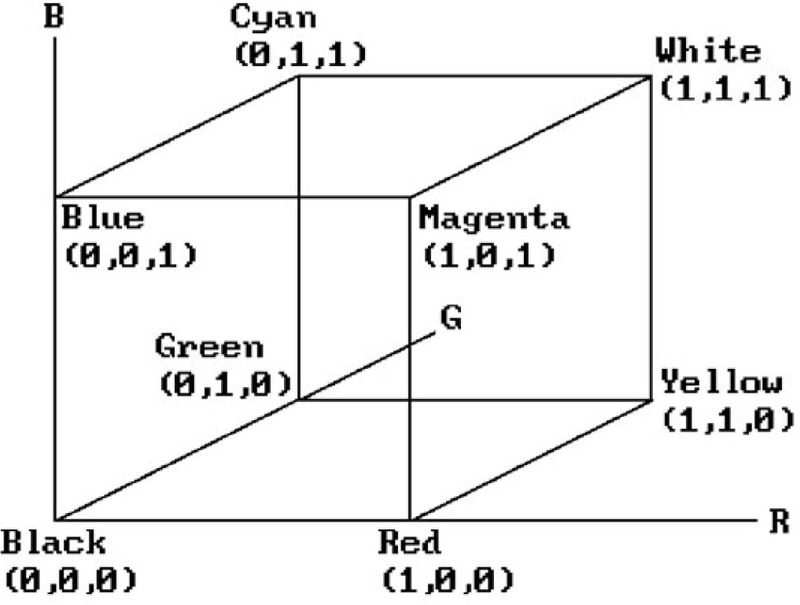 Diagrammatic representation for RGB Color Spaces. Color Components of both Linear and Non-Linear Transformations. Representations of Various Color Spaces Methods. YUV It is used for enhancing the rays obtained from the light illumination of the images. Correlation values can be differing from the linear Transformation, when it cannot be predicted as high as RGB. CIE The value of CIE intensity information can Independent and it used for easier detections, Lesser dependent image values. The circle shape of the apples can be detected based on RRM (Random Ring Method), the radius of the apple can be determined by the center of the apple. Segmentation of the apples based on recognizing with the certain range of (30-360) degree pixels during shooting distances from the camera. Another technique of fruit detection by recognition for robotic harvest based on feature image fusions. Tomato was collected and performed by using image acquisition method by taking 200 samples of images. The color segmentation is play an important role in detecting and partitioning the digital images into various multiple segments. Each Segmentation was assigned with different pixel images. In the reference29 surveyed segmentation algorithms based on threshold and to perform the values on segment using uniformity and shape measures. The Color for detecting the various color spaces such as R(red), G(green), and B(blue) which is used for finding the grape images with the three primary colors. R, G, B representation, can derive the various by either it can used for transformation process of both linear and nonlinear transformations. The color image was predicted towards the segmentation approaches by ad hoc networks. It can provide the strongly independent, results so we must improve the color images in vineyard fruit detections. These values are used to predicting the color images in the grape bunch. The paper depicts the application of vineyard detection in different classifiers and it can be hybridized with other machine learning algorithms to achieve better accuracy. The performance analysis of the color features of grape bunches should be improved in future work The study has presented a comprehensive literature review of vineyard detection that focuses mainly on grape detections. As more research in the area, there is a need for a more recent literature review on the subject to and in the vineyard development field. Nuske S, Achar S, Bates T, Narasimhan S, Singh S , authors. Yield estimation in vineyards by visual grape detection. In: In Intelligent Robots and Systems (IROS). IEEE/RSJ International Conference; 2011; p. 2352–8. IEEE. Cui Y, Fu L, Gejima Y, Su S, Wang B, Zhang F , authors. Kiwifruit recognition at night using artificial lighting based on machine vision. 2014 Montreal (Quebec Canada). 2014;1American Society of Agricultural and Biological Engineers. Nuske S, Achar S, Bates T, Narasimhan S, Singh S , authors. Yield estimation in vineyards by visual grape detection. In: In Intelligent Robots and Systems (IROS), IEEE/RSJ International Conference; 2011; p. 2352–8. IEEE.